This entry was posted in Bicycling & Fitness on July 12, 2009 by golinielcomblog. We first got a AAA membership when one of our boys was stranded at Timberline Lodge with no car keys. Buying aÂ family membership and having them cover the costs was cheaper than hiring the work independently.Â Great deal right there. Now I hear that our coverage will now pick us up if our bikes break down out on the road. How cool is that? AAA Plus now provides coverage for cyclists. Bicycle service benefits and exclusions provided under AAA Plus may be different than service benefits and exclusions for automobiles or motorcycles. Eligible Bicycles – Service applies to all bicycles and tandems, including rental bicycles and bicycle trailers, if service can be safely delivered using normal servicing equipment. Bicycle Repair – Service Vehicles are not equipped to repair a Member’s bicycle or change a flat tire, however, transportation for your disabled bicycle will be provided subject to the terms discussed herein. Coverage to Bicycle Rider Only – Bicycle transportation service is provided only for the rider whose bicycle is disabled or inoperable. To Obtain Service – A Roadside Assistance vehicle will be sent to the eligible disabled bicycle without charge from the nearest AAA contract station. Bicycle coverage applies to any eligible bicycle you are riding at the time the bicycle becomes disabled. Simply present your valid AAA card at the time of service. Members are expected to be with the bicycle at time of service. To any point of safety within a 25-mile radius of the bicycle breakdown. This entry was posted in Bicycling & Fitness on July 8, 2009 by golinielcomblog. JUNCTION CITY â€” Don Nielsen says he sells more than just appliances at his store, a fixture in the community since 1979. He prides himself on offering the customer a knowledgeable and friendly experience, rather than just trying to peddle a product. He can rattle off the details of any dishwasher, refrigerator or microwave in the store. And he and his staff are more than capable of dissecting the appliances on service calls to figure out their problems, he said. But Nielsen said it goes beyond just knowledge. He and his employees emphasize a relationship between the store and the customer. Nielsen said he feels like heâ€™s succeeded when he sees second and third generations of customers coming to the store. â€œIf you treat people right they will come back time and time again,â€ Nielsen said. Candy Cahill, the storeâ€™s receptionist and bookkeeper, said itâ€™s rare for the employees not to get to know the customers after two or three visits to the store. Itâ€™s taken Nielsen and his staff 30 years to build those relationships. Soon after Nielsen graduated from Junction City High School in 1971, he enrolled in Lane Community Collegeâ€™s appliance program. During the two-year program Nielsen learned the ins and outs of all things appliance. He said he concentrated on several different types of appliances during the first year, and refrigerators and air conditioning units in the second year. Prior to founding his own store, Nielsen worked at another appliance business for eight years. The first years at his own store werenâ€™t easy for him, he said. He didnâ€™t take a salary in the beginning. Instead, he and his wife, Carol, lived off her salary as a dental hygienist for several years. Nielsen did everything he could to keep the business alive during those years, with family and community members pitching in to keep the place afloat. Eventually, the sacrifice paid off. By 1988, Nielsen was in a position to hire Cahill. Six years after that, the store moved from the corner of Holly Street and West Sixth Avenue to the current address. Since the move to a more open space, the store has acquired new customers at a higher rate, Nielsen said. Ron Roggensack has been coming to Nielsen Appliance for three years now. Roggensack manages apartments in Creswell and does repairs on other units in Harrisburg. He said he always comes to Nielsen to get what he needs. On this day he was buying equipment to fix a dryer in one of the Harrisburg units. He always feels confident in the staffâ€™s product knowledge, he said. â€œTheyâ€™re really efficient at getting me parts,â€ he said. Nielsen, 56, said thatâ€™s the impression he wants customers to leave the store with. He said he emphasizes extensive training and superior knowledge when searching for employees, a philosophy that makes it tough for him to get qualified people. â€œItâ€™s hard when you have to add a person, to find that ideal person,â€ Nielsen said. In addition to the difficulty of finding good employees, keeping up with technology can prove exhausting as well, Nielsen said, adding that finding the most technologically sound and energy efficient units added a new wrinkle to his job. Over the 30 years in business, Nielsen Appliance has become a cornerstone of Junction Cityâ€™s business community. In 2007, the Junction City-Harrisburg Chamber of Commerce presented the store with the 2007 Small Business of the Year award. Chamber executive director Taryl Perry said NielÂ­senâ€™s staff shows a great combination of hard work and a friendly attitude. Nielsen has become part of the fabric of the community over the years, helping out with the biggest event of the year: the Scandinavian Festival. Nielsen said his company donates all the refrigerators for the festival. Cahill said itâ€™s a joy to have the level of trust that the business receives from its customers. Some people simply call the store and tell them when they need a new appliance. â€œItâ€™s amazing how many people will say â€˜Candy, I need a new washing machine. Pick one out, and the door is open,â€™?â€Cahill said. This entry was posted in Social on July 7, 2009 by golinielcomblog. This entry was posted in Bicycling & Fitness, Comics on July 6, 2009 by golinielcomblog. Weathers hot, and my hair is short, lets ride! We will be riding to the train station, taking Amtrak to Eugene. 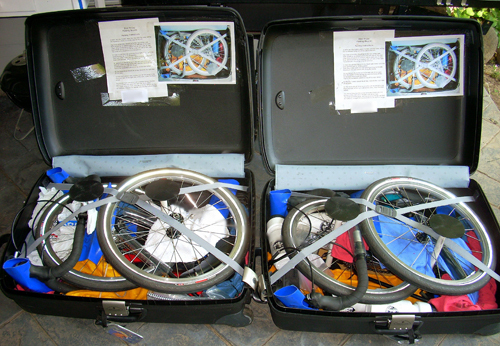 Taking the folding bikes and we are ready to use the racks or fold and bag them. This entry was posted in Bicycling & Fitness on July 2, 2009 by golinielcomblog. This entry was posted in Comics on July 1, 2009 by golinielcomblog.